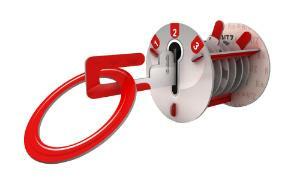 Build a combination lock mechanism and explore how it works! Discover how to crack the code of an ancient puzzle with the Koontz® Combination Lock kit. Did you kow that each combination lock is a puzzle? Only one combination can open the lock's unique design. 14 pieces, assembly required.